DreamForge Games is moving their production over to plastic. Honestly, I do prefer plastic minis, in general. Several months ago, I started searching for a way to improve the quality, lower the price and bump the production level to meet my customers’ expectations. I am happy to say that I have met and exceeded these goals. 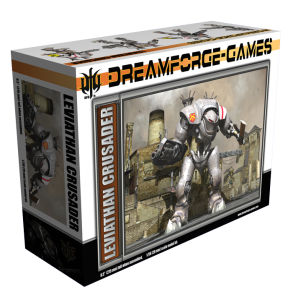 The Leviathan Crusader has made it to the pre-production phase (mold draft and parting line establishment for metal tooling) and is ready to become a plastic injected model kit. Not Resin, not Restic, not some soft plastic hybrid, but injected high impact styrene. The same kind of model kit you will find in any hobby store. On August 16th; the first day of Gencon, we will open up our Kickstarter campaign to help fund this switch from resin and metal miniatures and models to an all plastic line.